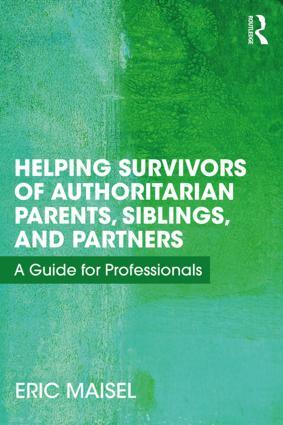 Helping Survivors of Authoritarian Parents, Siblings, and Partners considers the notion of the authoritarian personality in a family context and examines the extent to which authoritarians traumatize the people closest to them. Building on primary research, Dr. Maisel presents first-person accounts of life with authoritarian family members and provides clinicians and other professionals with tactics and strategies for helping clients who struggle with the impact of these experiences. This unique look at authoritarians at home serves to redefine the authoritarian personality, expand our understanding of family trauma, and give voice to the silent epidemic of authoritarian wounding. "This is an extremely important and helpful book for clinicians who work with couples and families, as well as for men and women who have grown up with an authoritarian parent or sibling and are seeking counseling. Based on his research and his own experiences working with individuals, couples, and families for many years, Maisel offers specific tools and techniques for healing. He also uncovers some very interesting findings on why women are more likely to reach out for help and what we can do to treat problems more effectively with our male clients. These issues are particularly timely given the present political climate, which has surfaced the hidden authoritarian tendencies in our culture." "Once again, Dr. Eric Maisel tackles an important and overlooked subject area with an essential and enlightening combination of first-person accounts and application of primary research. We learn what drives the authoritarian parent and how hate and a need to punish lead to the belittling and ridicule of children. The need to control through cruel means combined with a lack of guilt and shame lead to what the author has termed ‘authoritarian wounding,’ a trauma unique to those raised by an authoritarian parent. This book is a useful guide for recognizing the dynamic as well as a compassionate and practical approach to healing authoritarian wounding." "This is an indispensable book for mental health practitioners who work with traumatized clients! Dr. Maisel adds to the extant research on authoritarianism by pulling together firsthand accounts of people who have endured the wounds of authoritarian figures in their lives. He has expertly used this information to provide a practical guide for therapists attempting to help heal those traumatic wounds." Eric Maisel, PhD, is a retired licensed psychotherapist, active creativity coach, and internationally respected expert in the field of mental health reform. He is the author of more than fifty books, writes the "Rethinking Mental Health" blog for Psychology Today, and provides lectures and workshops worldwide.